In a small bowl, whisk the vinegar with the mustard. Slowly drizzle in 1/4 cup of the olive oil, whisking constantly, until incorporated. Season with salt and pepper. In a large nonreactive pot, heat 1 tablespoon of the olive oil. Add the carrots and fennel, and cook over moderate heat, stirring occasionally, until crisp-tender, about 8 minutes. Place the vegetables on a plate. In the same pot, heat the remaining 1 tablespoon of olive oil until shimmering. Add the sausage, and cook over moderate heat, turning occasionally, until browned, about 8 minutes. Add the lentils, shallots, thyme, bay leaf, and 5 cups of water; bring to a boil. Cover and simmer until the sausage is cooked through, about 10 minutes. Using tongs, remove the sausage to a work surface. Cover and cook the lentils until tender, about 15 minutes. Meanwhile, preheat the oven to 375°. Spread the walnuts on a small rimmed baking sheet, and toast until browned, 8 to 9 minutes, tossing once halfway through. Let cool, and coarsely chop. Partially drain the lentils, leaving them saucy. Discard the shallots, thyme, and bay leaf. Add the carrots and fennel to the lentils, season with salt and pepper, and toss with the vinaigrette. 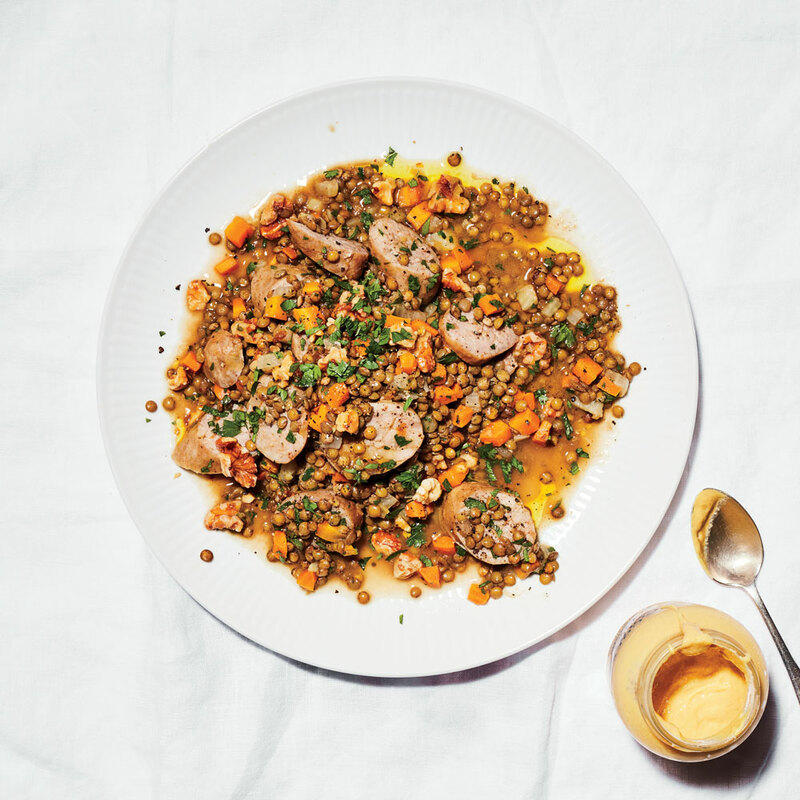 Thinly slice the sausage, and add to the lentils. Stir in the 1/4 cup of parsley. Top with the walnuts, sprinkle with more parsley, and drizzle with olive oil. Serve with mustard.